A Cornish pasty fresh from the oven is a real British delight. This warm, melting shortcrust pastry is packed with meat and vegetables creating a filling, hearty comfort food. It has been copied so many times throughout the British Isles over the years that its true origins have slowly disappeared. However, recently there has been a strong move to reestablish these roots, so much so the Cornish pasty (and its recipe) is now a protected food. To be called a real Cornish pasty, it must adhere to certain criteria—the ingredients that are included, the preparation method, the crimping technique (side crimping is a must), and even where it is made. The Cornish pasty is known and loved throughout Great Britain and Ireland and comes from Cornwall, located on England's southwestern tip. Fierce arguments abound as to the origins of the pasty with neighboring Devon also laying claim to the pasty—though, naturally, theirs is not called a Cornish but a Devon. No one person can lay claim to the pasty. It is believed that it was created for Cornish tin miners, who, unable to return to the surface at lunchtime, would have a hearty, easy-to-hold and simple-to-eat lunch dish. With their hands often dirty from a morning's work, the pasty could be held by the thick pastry crust without contaminating the contents. The thick crust also acted as an insulator, keeping the interior warm for several hours. Pasties were often also made with a meat filling at one end and a sweet filling of fruit or jam at the other, making a complete meal in one. 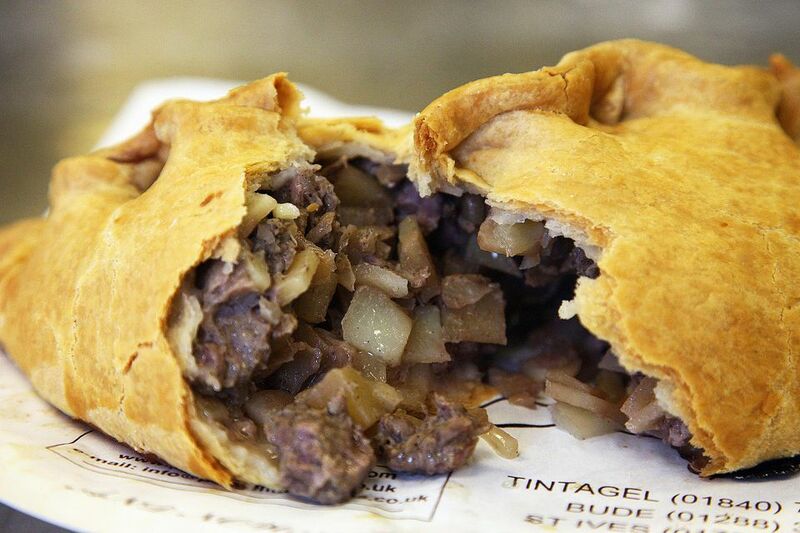 Pasties may no longer be the food of tin miners, but they are one of the nation's favorite snack or lunch foods. The pasty also makes a substantial supper dish when served with peas and gravy. To be considered an authentic Cornish pasty, the recipe must follow certain specifications. According to the Cornish Pasty Association, the filling ingredients must include roughly diced or minced beef (and no other meat but beef can be used), and only these vegetables: sliced or diced potato, turnip (called swede in the UK), and onion. There must be a minimum of 12 1/2 percent beef and at least 25 percent vegetable in the filling. And all of the ingredients must be raw when they are placed in the pastry. The pastry must be a shortcrust (which has a fat-to-flour ratio of 1 to 2), a rough puff (also known as flaky pastry), or puff pastry. No matter which dough is used, it has to be savory and be able to hold up to filling, baking, and handling without breaking. It can be brushed with egg or milk or a combination of both. And the final step is what makes it a true Cornish pasty: the crimping. The dough has to be sealed by crimping the edges to one side, giving it that signature shape. While traditional recipes will always use minced or diced steak, onion, and potato wrapped in shortcrust pastry, variations may include the addition of carrots or even peas. But these versions would not be considered authentic. It is not too difficult to make your own Cornish pasty; while the recipe may not fulfill all of the POD standards, it will still taste and look traditional.